A special mom deserves a special card, and this is it! She is sure to be delighted when she pulls this Mother’s Day card out of the envelope, and imagine her surprise when she opens up the inside. 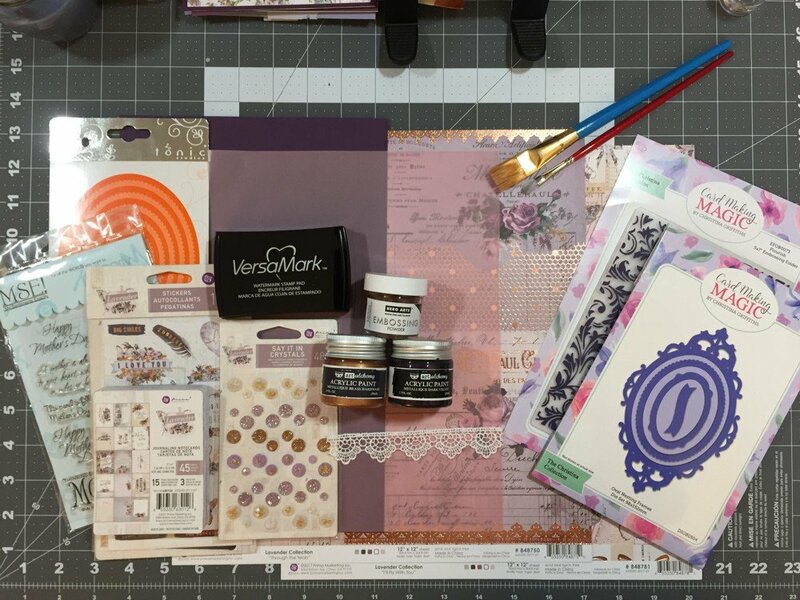 This card was a lot of fun to make and made great use of all the goodies in the Prima Lavender collection. 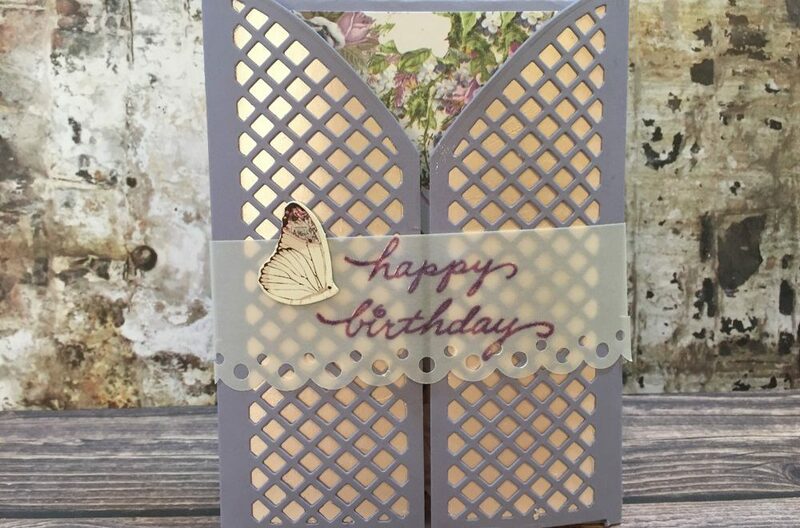 I love making twist-pop cards and this one was no exception. The hardest part was figuring out which of the beautiful papers to use for the inside. Normally, I’d use something a little more neutral on the inside, leaving the focus on the twist-pop mechanism. But the other half of the ‘Through the Years’ page was just too pretty to not use. Okay, I’ll take it back. The hardest part of this card was finding appropriate pieces to go on the twist-pop mechanism. Given the vast amount of cut-aparts, ephemera, and journaling cards, you’d expect it would have been hard to narrow it down. 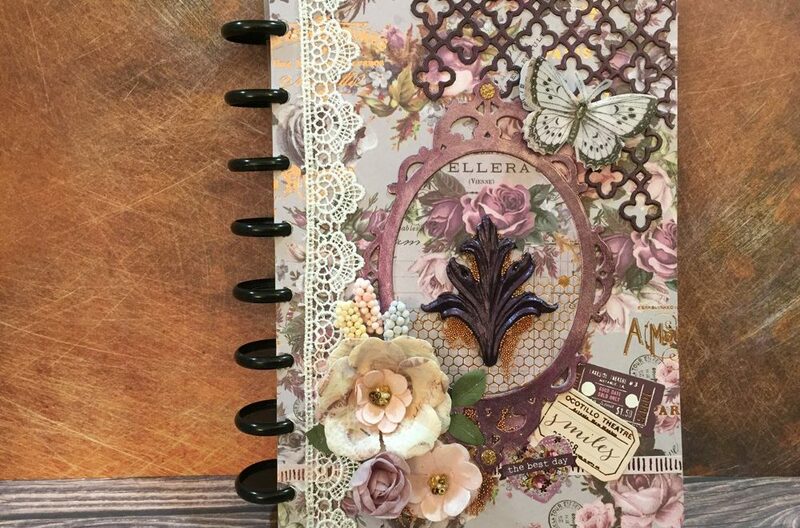 A lot of the pieces seemed geared towards scrapbook pages or bullet journaling, referring to past events. I had to expand the twist-pop mechanism to a full 12″ wide in order to use the 3″ x 4″ journaling cards. And even flipping through the journaling cards, there were few that were in the portrait orientation needed to fit the mechanism. I was glad I found four viable candidates and they turned out to be the perfect place to stamp my sentiments. I’ve made several twist-pop cards and have picked up some pointers on the way. But that’s just a teaser to look for a future blog post on how to make better twist-pop cards. Here’s a hint: it’s all in the paper! Enough about that, let’s move onto how I created this Mother’s Day card! For this card, because the inside of the card is the main event, I left the outside somewhat free of extra embellishments. What I did add were all flat pieces. With the thickness of the inside, I didn’t want to add too much bulk to the outside of the card. Since this card will be going through the mail, I didn’t want it to end up too thick and incur extra postage charges. Inside, I wanted to add some flowers to the bottom left corner, since it seemed I could sneak something in that was within the thickness of the twist-pop mechanism. 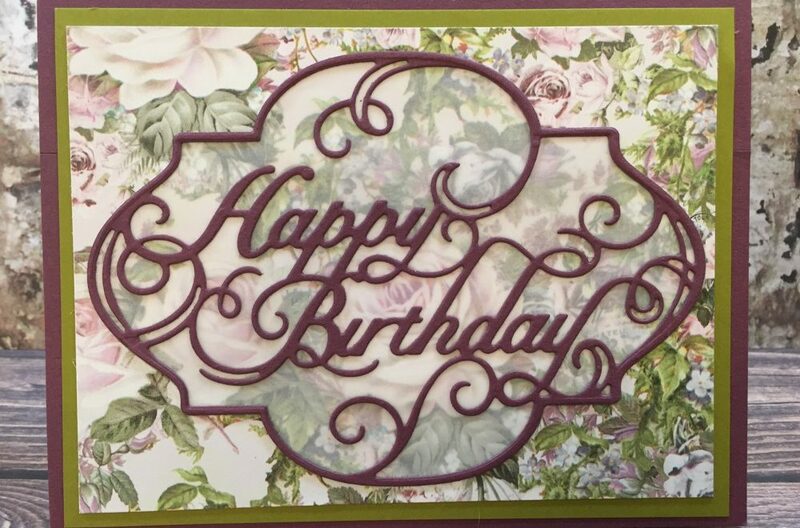 But, when I tried to find a flower or something, I realized that the mechanism came down too far towards the bottom of the card. In order for a flower to not get caught up, it would have to be within the bottom inch. That positioning would not be good design, so I left out embellishing the bottom. Somehow, the little butterfly successfully remained along the top without getting caught on anything. It seems that the more special the project, the more supplies there are. And this card is no exception. 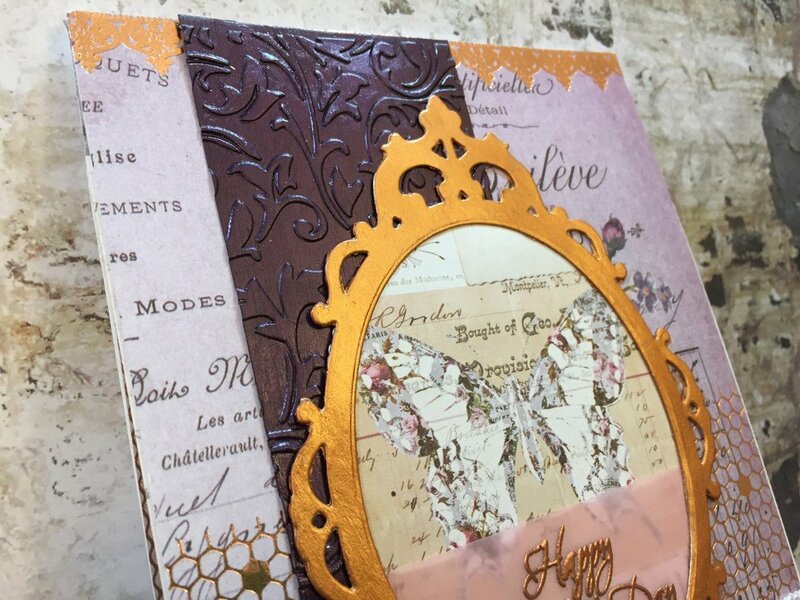 This project also features the Card Making Magic dies from the Christina Collection. These are the dies that I ordered from the UK. They arrived so quickly! Even going through customs, I think they got here in less than a week. Much faster than some other product I ordered from Utah that took almost 2 weeks through some invention called (NOT) SmartPost. And those didn’t even have to clear customs! 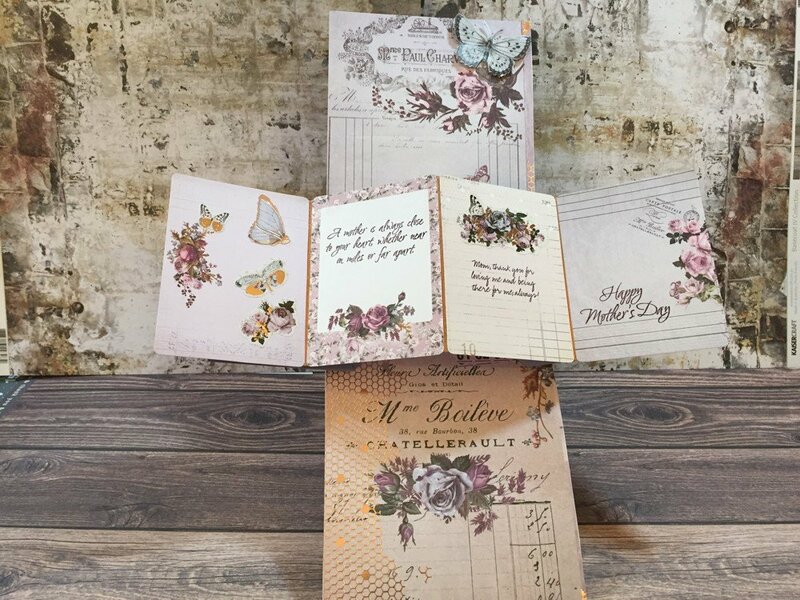 These dies and the embossing folder were a terrific value even when shipping and exchange rates were added in. I also used them on my Art Journal cover. Sometimes, it’s easier to watch how it’s done than to read about it. 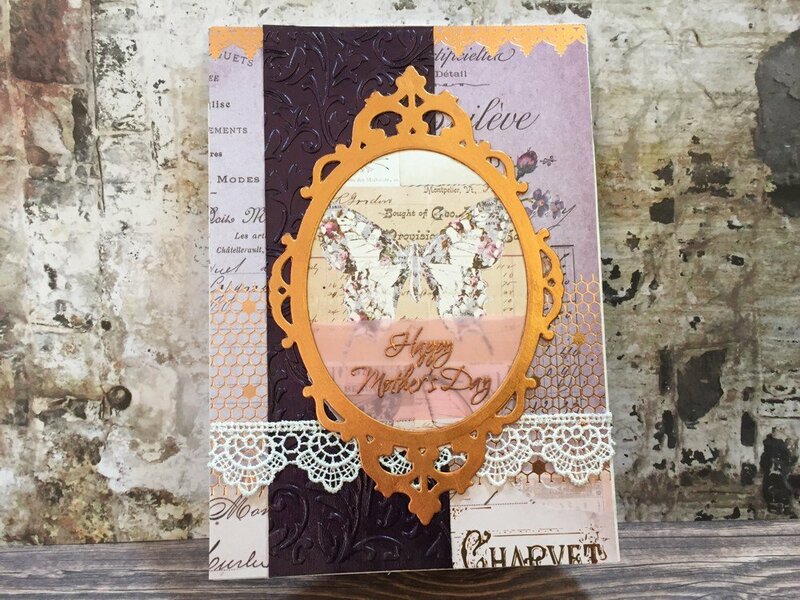 Check out the video tutorial on how this lovely Mother’s Day card came together. This card is the last in the series of five projects using this collection. You can find all of the posts by clicking here. If you enjoyed this post, please consider subscribing at the top of the page to be notified of new posts weekly. If this card inspires you, share it to all your favorite social media sites! Thanks for visiting today. Happy crafting!